LANCASTER – The University of Antelope Valley Pioneers (21-4; 10-1 Cal Pac) earned their eighth-consecutive win on Thursday evening after defeating the Redhawks of the Benedictine University at Mesa (7-13; 3-8 Cal Pac), 90-61 in intercollegiate California Pacific Conference women’s basketball action inside the Pioneer Event Center. With wins for both UAV and Embry-Riddle on Thursday night, a showdown is now set on Saturday afternoon with the prize of top seed for the Cal Pac Championships up for grabs as both teams currently remain tied atop the Cal Pac standings with a 10-1 conference record, respectively. The Pioneers are looking for a measure of revenge on their Senior Day as they look to defeat the only team to hand them a loss in conference this season, defeating UAV earlier this year on Jan. 10 in overtime, 101-96 in Prescott. Tonight, UAV came out of the gate strong offensively against BENU, outscoring the Redhawks 33-11 in the opening period. BENU would hold UAV’s explosive offense to just 11 points in the second period, but the Pioneers would take a 44-25 advantage into the intermission and would go on to earn the 29-point victory, 90-61. Junior forward Tylen Price (Lancaster, CA) led all scorers in the game with 17 points and also added seven rebounds, four steals and one assist, senior guard Daizah Pounds (Richmond, CA) added 12 points, one steal and one assist, and senior guard Samantha Earl (Covina, CA) finished with 11 points, two steals and two assists. UAV hit 35-of-69 field goals (.507), 12-of-27 three-pointers (.444), 8-of-16 free throws (.500), and outrebounded the Redhawks, 37-30. UAV committed 23 turnovers and stole the ball 20 times. BENU made 20-of-48 shots (.417), 5-of-17 three-pointers (.294) and 16-of-23 free throws (.696) and committed 30 turnovers and stole the ball from UAV nine times. 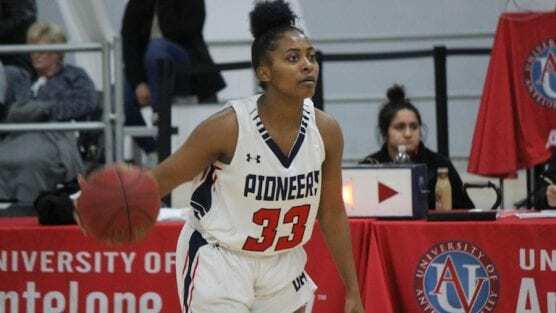 Next game: Coached by Deon Price, the Pioneers remain at home to host Embry-Riddle Aeronautical University for a California Pacific Conference contest on Saturday, Feb. 9 at 2 p.m. PST inside the Pioneer Event Center in Lancaster, Calif.